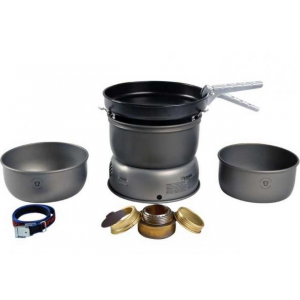 15 oz with 2 pots, stand, windscreen, and stove, which are integrated. It uses Esbit solid fuel or alcohol. 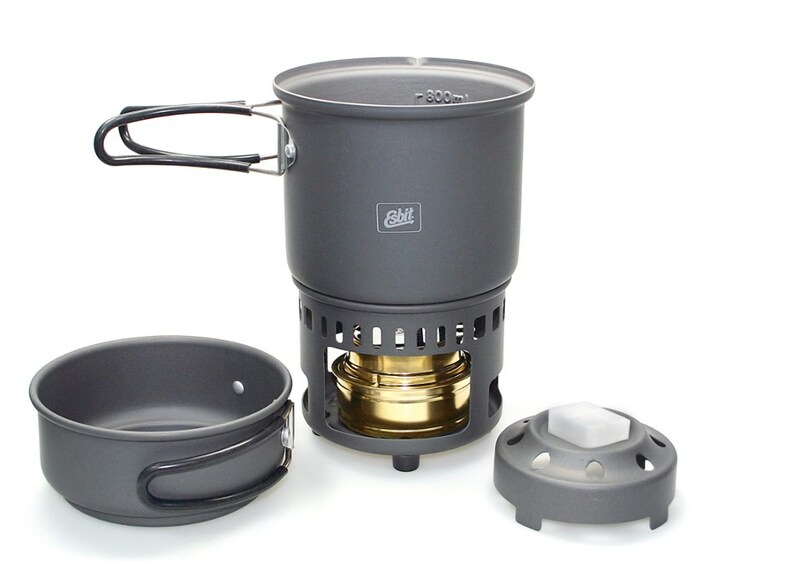 Nice and light, integrated pots and stove, and easy to use. I boiled 16 oz of water in 12 minutes. The stove has a screw top lid, so when you are done using it, unburnt fuel can be sealed with the stove and used. No waste. 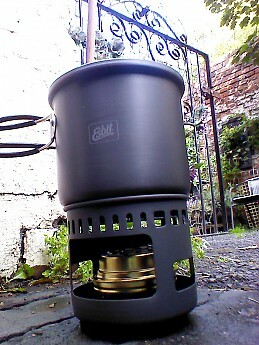 Very easy setup and the stove uses both Esbit solid fuel and alcohol. Very easy to start, just put a match or lighter above alcohol reservoir and light. 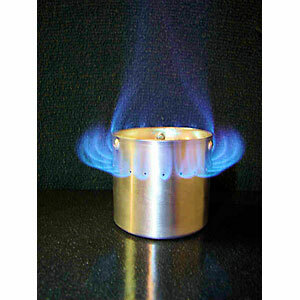 The stove has a flame extinguisher that is effective and easy to use to conserve fuel. It will burn for 30 minutes on 2.5 oz of fuel. The ad claims it will bring 30 oz of water to a boil with 1.7 oz of alcohol in 10 to 15 minutes. I was only able to bring 24 oz of water to a boil in 15 minutes. Even a light wind adversely affects the stove. I made an aluminum foil wind screen, which significantly increased its effectiveness. 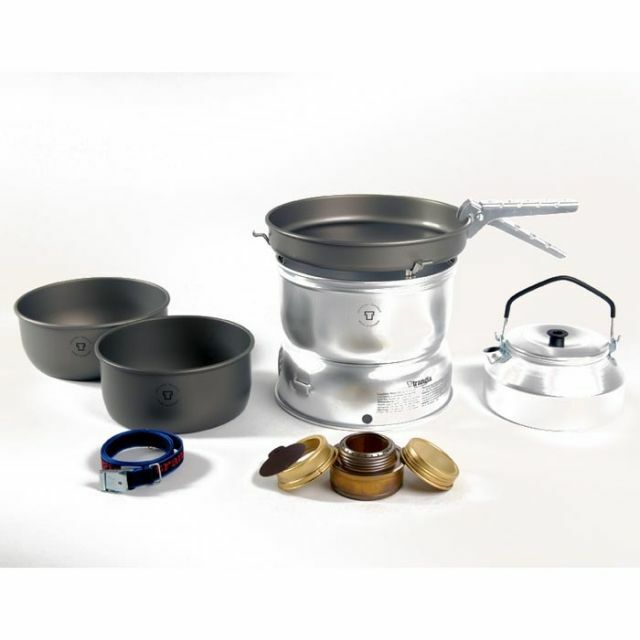 The stove nests into the pots and the entire cooking gear is very packable and secure. The handles are attached and stay cool even when cooking. 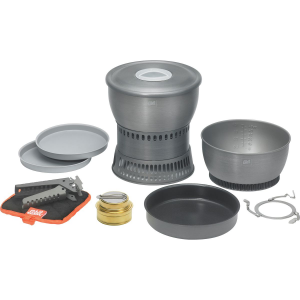 Esbit cs985h-ex cookset, very well made hard anodised with a 930 mil pot and lid. 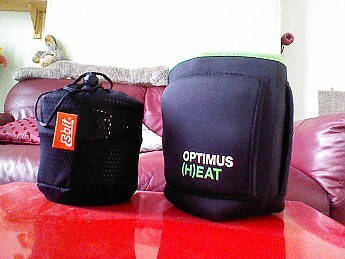 Here is a photo of the esbit cookset in its stuffsack next to my Optimus Heat Pouch (a perfect partnership!). The cookset weighs 430grams with out the Optimus Heat Pouch. 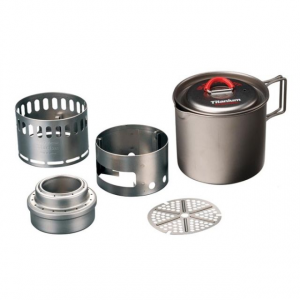 It is a very durable well made cookset and the heat exchanger fitted to the 930mil pot is a very nice touch. As you can see in the picture the cookset is really quite compact and if you use the Optimus Heat Pouch it fits in with room to spare. I did two boil tests, each with 500 mil of cold water. The first test was without a windscreen. 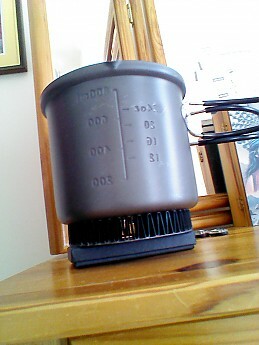 It boiled at 10.40. The second test was with a Trail Designs 6-inch windscreen the standard one. The result blew me away I got a boil at 7.30 which I am very pleased about that and the rugged dependability of the cookset. The stove set used 26mil of meths to boil the 500mil of cold water. I do find that the burner works best if you fill it to capacity! So all in all a lightweight dependable cookset. Here's a side view of the esbit 930mil pol you can see the graduations and the heat exchanger on the bottom. 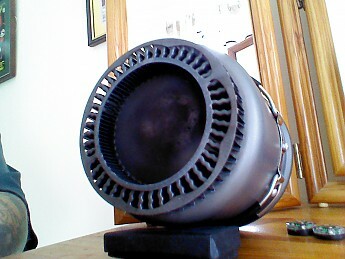 This is the bottom of the esbit showing the heat exchanger. hm...mine doesn't have the heat exchanger, but works equally. Packs small and is lightweight. 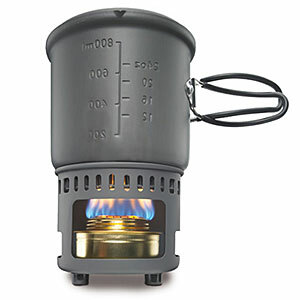 This stove is perfect for one person on a backpacking trek. I use it regularly. I prefer the fuel tablets as they don't go bad, are reliable, and the only thing you need to carry out is the wrapper. Great product. I love Esbit products. This stove is no different. I like how it nests inside itself very easily. I don't have to try it one way and then try it a different way to get it to fit. It's quick and simple. For backpacking, I prefer to use the fuel tabs as they don't leak, don't go bad, and don't take up much room in my gear. Plus, I only have to pack out the wrapper, not an empty fuel container. Another great product by Esbit. Welcome to Trailspace, David. Thanks for the review. Have you used this stove with alcohol or just the tablets? I use it both ways. I use the tablets on the trail and the fuel stove for car or base camping only. The fuel stove works great, but I'm always concerned about leakage if I throw it in my pack. Plus, like I said in my original review, I like that I don't have to carry around a fuel container.